We’ve been needing goals for so long. And four in one game is almost too much to ask for. But we’ve been asking, and today, they came through in a big way. The game itself was kind of poor, especially the first half. But no one ever cares about a poor performance when you have three points and four goals on the scoresheet. So today was more about letting off some steam. Poor SPAL, the scoreline absolutely does not reflect their efforts in this match. They had some very close calls, including a Viviani free kick in the 41st that completely cleared the wall and hit the post. Milan’s defense was poor, it was like they were still sleeping for much of the first half. I know I wish I would have been, the game was at 6am for me. As if feeling my pain, Milan were clumsy and unfocused and failed to show as much of the teamwork that they had showed in recent matches. The goalscoring was immediate, though. Cutrone scored less than two minutes in. 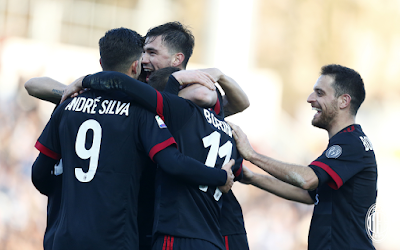 It was on the rebound of a Romagnoli header, and Cutrone, always opportunistic, sent it right into the back of the net. 1-0. My theory was that this confused everyone, the whole scoring right away thing, and perhaps that is why they were so disorganized and unfocused. So much so that Kessie got a yellow in the 17th, which will see him suspended for the Sampdoria match. Geez, what a kid’s got to do to get a break. Despite the introduction of our former Paloschi in the 55 th minute, SPAL could not find an equalizer. But in the second half, Milan pulled it together a little bit and in the 65th, on a cross from Suso, Cutrone scored again. 2-0 Milan. I do hope Silva is okay. 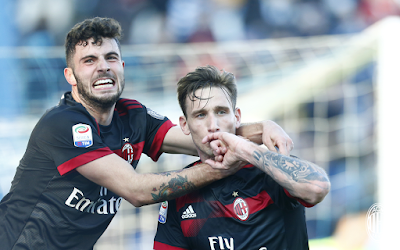 But no time to even check on him, Biglia scored his very first red and black goal in the 73rd, a great shot from distance. 3-0 Milan. That gave Gattuso so much confidence, he was even willing to sub him off for Montolivo two minutes later. Poor Silva had to come on for the hero Cutrone in the 77th, that’s a tough act to follow. But the masterclass sub proved to be Borini on for Kessie in the 84th. That’s right, Montollivo and Borini were on the pitch at the same time. And apparently, Milan have improved so much that Montolivo assisted Borini for his goal in the 90th minute. 4-0 Milan. The probability of that happening ever is so low that there may have been a fluctuation in the gravitational pull on the earth. I’m just saying. But then again, I don’t think anyone expected a team that has been so goal deficient this season to pull off a 4-0 win over anyone. But when the pressure builds up for so long, even the scoring legend Borini is going to let off some steam. This was a feel good win for everyone not called SPAL. The goals don’t only help with our lethargic goal differential, they help heal our hearts and make us smile. That Cutrone kid is proving Galliani and everyone wrong who said that we don’t have any stars in our youth sector. And we didn’t even have to sell him on the cheap and then see his value go up 60 times or more in like five or six years elsewhere. This time, he’s ours. He showed us what we’ve been missing by painfully and foolishly starting Kalinic every single game this season: goals. Even Biglia and Borini can score when he’s not on the pitch. And with that miracle, they each took turns letting off some steam.